positive state of mind, never with a negative. Plus force, not minus, does things. attitude of mind for their exercise and application. from doubtful to certain, from shrinking and retiring to asserting and advancing. It is the decisive, positive soul that wins. If you wish to amount to anything in the world, never for one moment permit the idea to come into your mind that you are unlucky, that you are less fortunate than other human beings. Deny it with all the power you can muster. Discipline yourself never to acknowledge weakness or think of mental, physical, or moral defects. Deny that you are a weakling, that you cannot do what others can do; that you are handicapped and must be satisfied to take an inferior position in the world. Strangle every doubt as you would a viper threatening your life. Never talk, think, or write of your poverty or unfortunate condition. Cut out of your life all thought that limits, hampers, dwarfs, and darkens it. These are ghosts of fear; the Creator never made them or intended them to haunt or torment you. He made you for happiness, for joy, for conquest over your environment. Persistently affirm that the Creator handicapped no one; that our limitations are all our own. Resolve that, come what may, you will be an optimist; that there shall be nothing pessimistic in you; believe in the final triumph of the right, the victory of all that is true and noble. 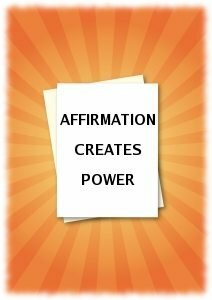 Affirm that you are one of the most fortunate beings. Congratulate yourself that you were born just in the nick of time, and in just the right place; that there is a definite work for you to do that on one else can do; and that you are one of the most lucky persons in the world to have the opportunity, the health, the education, to do the thing you are bound to accomplish. If you are out of work and poor, just throw out of your mind every idea of penury and poverty. Hold the thought of plenty, of abundance, of all good, which the Creator has promised you. Stoutly deny that you are poor, or miserable, or unlucky; claim that you are lucky, that you are well, vigorous, and strong; that you must succeed; and you will succeed. Always affirm that the Creator who gave you the longing to be somebody and to do something in the world, has also given you the ability and the opportunity to realize the ambition. When you set your mind toward achievement, let everything about you indicate success. Let your manner, your dress, your bearing, your conversation, and everything you do speak achievement and success. Carry always a success atmosphere with you. You will find a wonderful advantage in starting out every morning with the mind set toward success and achievement by permeating it with thoughts of prosperity and harmony, whether by repetition of set formulas, as some advise, or not. It will then be so much the harder for discord to get into the day’s work. If you are inclined to doubt your ability to do any particular thing, school yourself to hold the self-trust thought firmly and persistently. It is the assumption of power, of self-trust, of confidence in yourself, in your integrity or wholeness, that cannot be shaken, that will enable you to become strong, and to do, with vigor and ease, the thing you undertake. life will take on a fresh meaning. it will be a powerful tonic for your health. It will help you to build up individuality and personal power. It will make your brain clearer, your thought more effective. Keeping the mental machinery clean makes for vigorous thinking, decisive action.